Three weeks in a row.........Wooo, go me! Straight to it this week, as I've already written one post, about my sons birthday. Monday: Birthday Tea for RJ. Lots of pickies, hot and cold. Tuesday: Coq Au Vin. It was meant to be on last weeks, but didn't end up making it. Wednesday: Corned beef Stew. This was a huge hit last week, so it was requested again. Thursday: Pork Chops with mash and veg. One of my favourite meals. This year is all about thinking of myself a little more, here's the proof. Saturday: Cheese and potato pie. Not had this in ages, it's a lovely warming winter meal. Sunday: Roast Chicken with all the trimmings. So that's it, my shopping is still coming in at around £50, this pleases me no end. Last week we mostly stuck to plan, although all on the wrong days, but at least it was eaten! 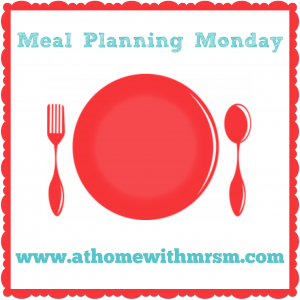 As always, linking up with Mrs M, go take a look for some great ideas. I love to read the plans, and to know what you're all having, so do share. I hope RJ had a great birthday!! Great sounding plan, I want to hear more about this corned beef stew, sounds like my sort of comfort food!